God is the source of every good thing, and He has given people talents—including vocal talents—for the purpose of glorifying Him. 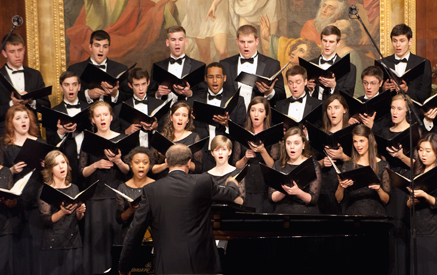 BJU’s voice performance program equips you to glorify God through excellence in the field of classical singing. You’ll learn how to perform with professional technique, diction and style, and how to use your life and voice to point others to Christ. 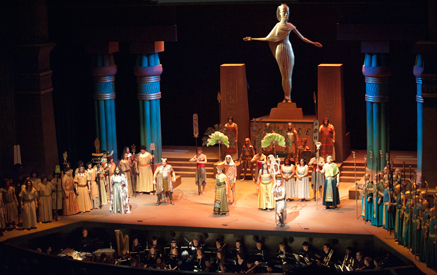 BJU’s voice performance program prepares you for the challenging field of the performing arts. Our top-notch courses help refine your natural vocal talent, build your confidence, and equip you to excel in this highly competitive field. You’ll take courses in music theory, conducting, music history, and ear training so that you learn how to rehearse more effectively and express yourself in music. In addition, you’ll take courses in French and German, and you’ll learn advanced diction in English and Italian so that you can understand and communicate in a variety of languages. Your sophomore year you’ll put what you’ve learned into practice in an examination that will help determine your progress and readiness for this field. Our voice faculty will mentor you as you train to become the very best classical performer you can be for the glory of God. Liberal arts courses, such as economics, philosophy and speech, will challenge you to see life from a broader perspective. These subjects will also help you develop essential life skills such as critical thinking, problem-solving, creativity and effective communication—skills necessary for flexibility in your job. The importance of communication skills cannot be overstated for a musician, and these core courses will enhance your powers of expression. In addition, your Bible courses will connect your pursuit of God to all of life—including your work as a vocal performer. These courses will better equip you to pursue God and will remind you to allow your knowledge of Him to inform your ethics and practices in the field. And more importantly, you’ll learn how you can point others to the beauty and holiness of God and the hope found only in the person and work of Jesus Christ. 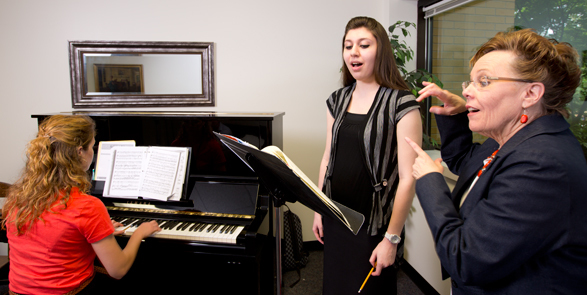 Because the voice performance program is comprehensive, there are no electives included. However, you can take online courses during the summer to free up your class schedule during the semester. The BJU voice faculty were amazing. Supportive and encouraging, but demanding and honest. It was apparent from day one that BJU did not aspire to mediocrity, but rather to excellence. Our biweekly voice seminars gave all of us music majors a chance to perform in front of peers and faculty. Learning how to prepare for performance—always by memory—and how to take care of our voices properly was vitally important for future success. The discipline required for daily vocal exercise and practice time (including translating foreign text for opera and researching background material or interpretive customs for the pieces one is working on) is not easy; but, establishing those habits early in life gave me a step up when I was out on my own trying to work as a performer. Occasionally a fellow performer will comment on my work ethic, and it is an excellent way to open the door to conversations about the God I serve and why excellence is so important. At this stage in my life, I am navigating more in theater roles. I still enjoy opera outreach in schools for Opera Santa Barbara, but most of my performing these days is concert solo work or musical theater roles. Whether I am preparing for a play, a musical or concert, I rely on the tools I received from BJU and the good habits my teachers helped me develop. I am thankful for the career guidance and the spiritual guidance I received at BJU from so many faculty members. Their caring attention and wisdom will always be a part of who I am as a performer. Once you complete your platform check during your sophomore year, you’ll prepare for two recitals: one in your junior year and one in your senior year. These recitals are a significant part of the voice performance program and play a major role in preparing you for your profession. Your junior recital features five or six memorized songs in various languages and style periods. This recital helps you prepare for your senior recital, which features an operatic aria and art songs in several languages. Your senior recital offers you some flexibility in memorization if you choose to include other performers in a chamber group that features you as soloist. Each of these recitals is designed to help you build your repertoire, teach you how to prepare for performances, and give you practice memorizing your pieces and singing in various languages and styles of music. Additionally, you’ll be exposed to accomplished artists in the Concert, Opera & Drama Series, such as the King’s Singers, Canadian Brass and Prague Symphony Orchestra. You may have an opportunity to perform under professional guest conductors in productions that are part of this annual series. You’ll also have opportunities to participate in state and regional auditions sponsored by the National Association of Teachers of Singing (NATS) and the Metropolitan Opera Association. The choral program is composed of eight choirs: University Singers, Conductor’s Chorus, Collegiate Choir, Concert Choir, Lyric Choir, Chorale and Chamber Singers. All students are welcome to audition and are placed according to their classification and abilities. Singers are re-auditioned periodically to determine proper placement. Performance venues include concerts of standard choral literature and church music and opera and oratorio performances. The best way to prepare for singing in an opera is, of course, to sing in operas. That’s why at BJU you’ll be able to audition for our award-winning opera productions. Students have been cast in supporting roles and have even understudied the primary roles in famous operas including Rossini’s The Barber of Seville, Saint-Saens’ Samson et Dalila and Verdi’s Il Trovatore. In the past few years, our grand productions have placed in the top 3 in the professional category of the National Opera Association’s annual video competition. As you prepare for the opera performances, you’ll grow in your understanding of the voice profession and of the challenges you’ll encounter in it. BJU’s voice performance faculty members have attended top universities and professional workshops, and many have won awards and honors for their performance. Through individualized instruction, they’ll train you to excel in your career, and more importantly, they’ll challenge you to make biblically based decisions and to reflect Christlikeness in all you do. Apply knowledge of standard vocal literature to performance. Acquire an advanced skill level of German, Italian, French and English diction. Exhibit a working knowledge of healthy vocal function. Perform with artistry, drama and proper stage deportment.